General Ophthalmologist & Neuro-ophthalmologist. Visual Electrophysiology, Hereditary Retinal Diseases and Medical Retina Services. Dr Matloob specialises in General Ophthalmology, Neuro-Ophthalmology and Visual Electrophysiology. She also works at Waikato Hospital as a specialist Ophthalmologist and Neuro-ophthalmologist with special interest in Medical Retina. Dr Matloob had extensive experience in General Ophthalmology before taking up Neuro- ophthalmology as a subspecialty. She graduated from the medical school in Iraq, where she also did her 4 years training in Ophthalmology. Selma then moved to Jordan, the UK and NZ for further work and degrees and thereafter to the US for subspecialty fellowship and training. In Jordan Dr Matloob qualified for the Board in Ophthalmology, in the UK for FRCS and MRCO in Ophthalmology and in the US for a Fellowship in Neuro-ophthalmology and training in Electrophysiology of Vision, Hereditary Diseases of the Retina and Medical Retina. 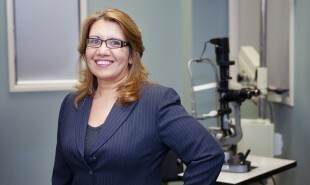 She recently established an Electrophysiology of Vision service at Hamilton Eye Clinic, the first and only service in the Midland region. She loves travelling, has visited more than 30 countries and dreams of travelling around the world with her husband sometime in the future, to explore the bright side of the world away from wars and hatred and to acquaint herself with people from various and different backgrounds and cultures, socialising with them whenever possible. Selma also loves working in the garden, admiring her organic veggie box and fig trees and has a passion for cooking too!! !